On the day of their LASIK surgery, patients are typically excited and nervous at the same time. We, at Mandel Vision®, believe that if you are confident in the skill of your LASIK surgeon and know exactly what to expect from your LASIK surgery, any anxiety you may feel can be greatly relieved. When you check in for your LASIK surgery, you will first be greeted by our Front Desk Supervisor, Evette McGill, who will call laser vision consultant, Missy Grohne or Karem Sandigo, to the front desk to get you started on your big day. After making sure that you have completed your informed consent and payment has been finalized, you will be escorted to the Wavefront room. We believe our high success rate is due in large part to the fact that we obtain the most up-to-date measurements of your eyes on the day of surgery. This analysis will be used by your LASIK surgeon, Dr. Eric Mandel, to create a customized plan based on the exact specifications of your eye. After Dr. Mandel reviews the results and is satisfied with his findings, you will be sent to the waiting room to await your procedure. You should refrain from reading in the office as this can affect your results. 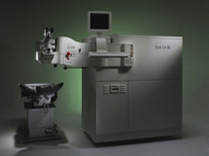 Next, our laser technician, Gabrielle Suh, will call you into our state-of-the-art laser suite for your procedure. Before you enter the suite, the laser will be calibrated, and all of the tools needed for your LASIK surgery will be sterilized and prepared. After your name is confirmed, you will take a seat in the laser chair. We will administer a disinfectant preparation to your eyelid area and instill drops to numb your eye. To make the process more comfortable, you will be given a teddy bear to hold and you will hear music in the background. 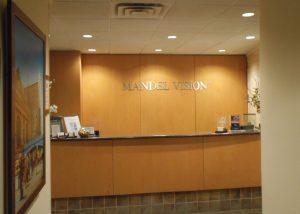 Your LASIK surgeon, Dr. Eric Mandel, will then enter the room and confirm your measurements prior to treatment. To help you relax, Dr. Mandel will talk to you throughout the process, but his concentration will always be on your LASIK surgery. Dr. Mandel will ask you to open your eye and focus on a flashing light. A lid holder will keep your eye open, and Dr. Mandel will ask you to tell him when the flashing light disappears. You may feel a slight pressure around your eyes. The exam chair will be rotated toward the IntraLase laser and will then be rotated back to the VISX Star S4 excimer laser. You will then hear the sound of the laser and notice the smell of the laser gases. After less than a minute of laser time (in most cases), you will feel the sensation of cool water and eye drops being instilled. In Dr. Mandel’s hands, the entire procedure takes less than 5 minutes, from beginning to end.